I started my research on this blog entry thinking I was going to give you an easy, free solution to make sure you are secure when surfing from an un-secure Internet connection. First let's discuss the problem we're trying to solve. Whenever you connect to the Internet over a network that others have access to, you open yourself up for others to track and intercept your habits and data. This is called a "man-in-the-middle" attack. I was provided a used laptop at my new job a few months back, and I was surprised when I did not find a pre-installed CD burning software such as Sonic or Roxio. This led me on a hunt to find something for free; I ended up with CDBurnerXP. 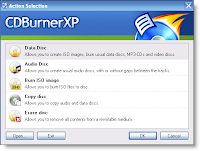 I was quite impressed with how easy to use CDBurnerXP is to use -- the screens are very intuitive and helpful. When creating a data disk, you get a Windows Explore like view on the top half of the screen, where you can navigate to the files you want to burn and drag them to the bottom half of the screen. Seems obvious and simple, but not all programs work so well. As I add my files, a bar across the bottom shows how much space I've used; if I exceed the capacity of my disc, the background color changes from green to red. before I find that the My Computer view is much less helpful when interacting with files than the Explorer view. By default, when you click on My Computer or My Documents, and folder and drive shortcuts, the left pane contains links to Make a new folder, Publish this folder..., and other not-so-helpful links. I like the Explorer view which has a tree of all folder, open to the folder that I've selected.. Well, with an easy Registry change, the behavior of My Computer and the like can be changed to open in an Explorer view. Go to HKEY_CLASSES_ROOT\Folder\shell and set the default value (Value data) to "explorer" -- that's it. I recently started having a problem where my Excel 2003 and Word 2003 files would not open when clicked, unless Excel and/or Word was already open. If the application wasn't open, it would open the application, but not load the file. I did quite a bit of searching, but couldn't seem to find the right answer. Some sites recommended checking a setting to Ignore other applications -- a setting that wasn't even available in Word. Turns out for both applications, it was the Addins that were causing troubles. To remove the offending Addin, you need to edit the Registry. Here's the process I used. Assume you start with your data in CSV format, the first step is to Import the data into Access (File > Get External Data > Import...). 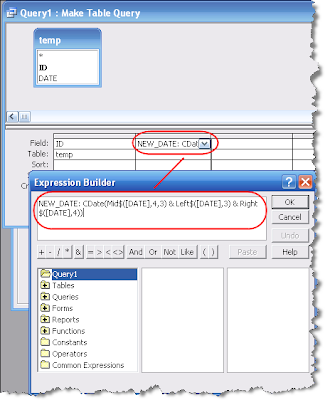 When importing the date field, import it as text, therefore loading all the data into your database.Create a Query to convert your date data and change from text to date format. NEW_DATE: CDate(Mid$([DATE],4,3) & Left$([DATE],3) & Right$([DATE],4))Run the query to validate that the formula is entered correctly.Once verified, change the Query Type to a Make-Table Query. I discovered an easy fix to crashing iPhone Apps... turn Airplane Mode on and off or shut your iPhone off and on. By doing this, your iPhone re-establishes itself with the cell phone network. This reminds me of troubles I used to have with my old Sprint phone -- the longer I had it on, the more likely I would have problems with dropped calls. According to Sprint at the time, the cell phone needs to periodically re-establish itself with the cell database. This seems to have worked for me with the iPhone, as my crashes were always occurring when the iPhone was interacting over the network, such as trying to establish my location. Note that I have a first generation iPhone on firware 2.0.1. Let me know if this works for you or not. If you're like me, over the years I've started to forget some of those old DOS commands. One that we still need to use occasionally is the cd command to navigate to a file in a different folder, because whenever you go to the Command Prompt you begin in the C:\Documents and Settings\[your username] folder. With a minor entry into your Folder Options, you can actually open directly to the folder you want using Windows Explorer. I found a new tool from Microsoft that will evaluate the security of your PC, and give instructions on how to correct potential vulnerabilities. 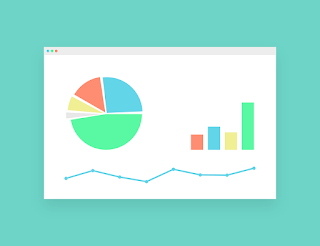 Microsoft Baseline Security Analyzer (MBSA) is an easy-to-use tool designed for the IT professional that helps small- and medium-sized businesses determine their security state in accordance with Microsoft security recommendations and offers specific remediation guidance. I was looking earlier in the week for a simple utility to monitor a folder and update equivalent folders on two other machines, based on content changing. I found SyncBackSE from 2BrightSparks to do the trick. This $30 utility program saved me countless hours in writing my own solution. SyncBackSE comes with a fully functional 30 day trial. SyncBackSE can be used to backup files or to keep folders in sync. Sounds pretty simple, but it can get rather complex. 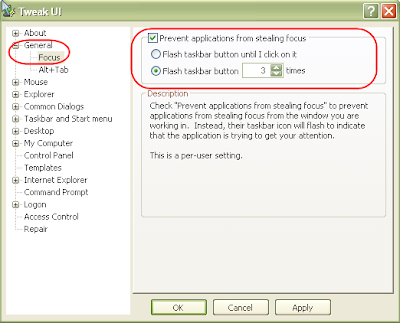 SyncBackSE has two configuration interfaces, easy and expert. Let me run through creating a simple backup Profile. I have updated my 2006, Firefox 2 keyboard shortcut tri-fold for Firefox 3. I added about a dozen new keyboard shortcuts from my prior version. Click on each of the gif files to view a full version or just download by right-clicking. Print one image on each side of your paper, and then fold into three. For those that prefer the Firefox 2 address bar, try the Oldbar plug-in.Save a step of having to arrow or mouse down to the first item in the awesome bar, install the Enter Selects 3 plug-in.Aging Tabs will continually darken the color of tabs the as time passes since you last viewed the particular tab.Instead of reopening a closed tab using History, you can accomplish the same task with a button using Undo Closed Tabs Button plug-in.Firefox Showcase let's you view thumbnails of all your tabs in a single window. Just a few nights back after work, following a fairly normal routine, I accepted the iTunes request for an update to 7.7. Upon completion and plugging in my iPhone, I was prompted to update the firmware to 2.0.1. Again, I accepted. During the middle of this process, iTunes crashed. Upon clearing the dialog boxes, iTunes restarted (my iPhone was still connected). Only this time, iTunes had nothing in it's library -- no music, no movies, no Podcasts -- nothing. And then looking at my iPhone, it was cycling between the Apple logo and an image of a USB plug and the iTunes logo -- my iPhone had become an iBrick. Wow! In a bit of shock, I tried closing and restarting iTunes, and I tried shutting down and restarting my iPhone. Neither one helped. Here I went from a few casual, routine updates to a lot of unplanned for, and really unnecessary rebuilding. First, i had to figure out how to un-brick my phone. I live in an apartment complex, and I have found that some folks leave their wireless routers open for anyone to join. In addition, for those that are "locked down," the default password was never changed. Why is this? Well networking computers used to be a difficult task, but with today's advanced routers and OSs, it's easy to setup your own network -- and cheap too. You can go down to your favorite "big box" retailer and for less than $50 pick up a fast wireless router. If you already have cable Internet access, just plug-in the router, and it works (DSL requires some configuration). Unfortunately for the non-geek crowd, they are leaving themselves open to anyone who wants to access their network and the computers that are connected to it.